Hello My Creative Friends & welcome to another Imagine Nation Monday! For my project today, I decided to use the "Best Friends" cartridge! This 8x8 layout could NOT be anymore simpler!! ;) You can see how it was done in my video! For all the sentiments I used are from my stamp set "Mom You Rock"! I don't "Love" this page, but when you are in a super hurry, the Imagine definitely comes to your rescue! What you didn't see in the video was that I added some dk. brown stitching & some stickles to the butterfly! P.S. The winners to both of the blog hops will be posted here tomorrow (Tuesday)! Gorgeuos layout! Love the colours very pretty! Love that layout. I am an animal lover too in fact I volunteered at our zoo for 20 years. Awesome layout. Simple yes, but super cute! I LOVE your project!Super cute idea,I recieved this cartridge in the mail last week,And I am LOVING it!I ordered some stamps from you last week and can't wait to get them!! Thanks for sharing this super simple layout!! You ROCK Emma!! Super cute layout, Emma! I love what you did with the fibers. It looks so pretty! Gorgeous Layout,Emma!!! It's simple but beautiful! I love this Lo Emma. So pretty. You know I love all your work and you always do such an amazing job. LOVE your stamps and I can't wait to get them ALL. Can't wait to hear your announcement. Cute layout! I love all the layouts you've been making lately! Cute Cute Cute!! I didn't know that was on that cart:) Thanks for the tip! What a beautiful layout!! I need to consider doing 8 x 8's instead of 12 x 12. They just seem like they would go together much easier. You just make it look so simple....Thanks for sharing! Great work Emma!! Love the layout. Always looking for new ideas. I have sooo enjoyed using this set of stamps. Can't wait to create more Mother's Day projects. I love your stamp sets and plan add some more very soon! Very pretty layout, I love the colors. Great job showing how you can decorate a single page to make it more handmade looking. This is so wonderful, Emma! I never think to use stamps on layouts. Thanks for the ideas! omgosh seeing this makes me want an imagine!! Awesome job! What a lovely layout the colors are great. Thanks for sharing. emma, I love this layout! Emma, I am so scrap-lifting this idea. SUPER CUTE! This was great. 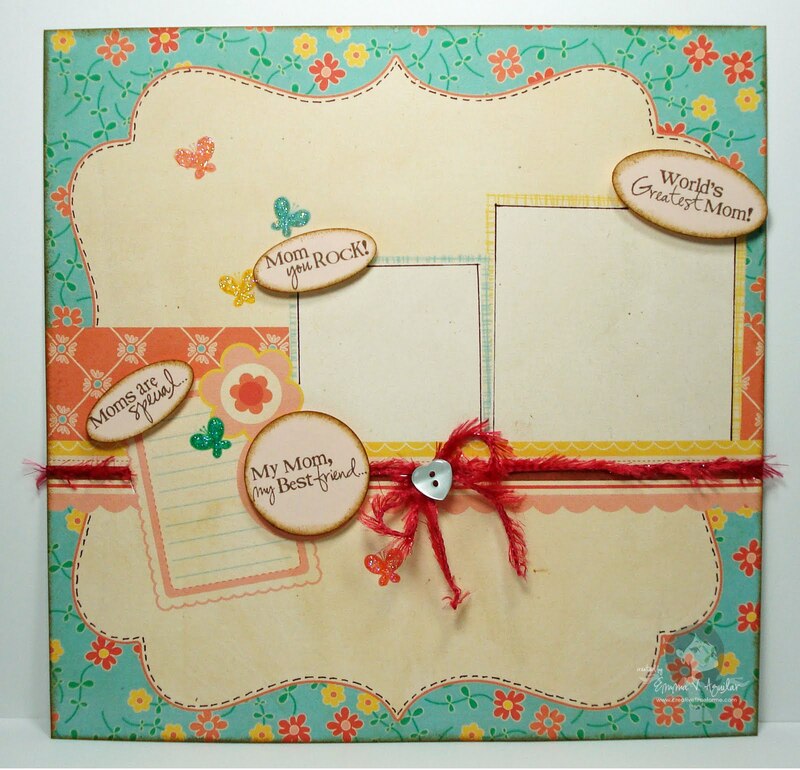 I'm going to my craftroom to make something similar with a premade layout. I had no idea how to use it before this. Thank you!